We have barely gotten started here and already we are feeling some love with people linking to us in order to share the bi love and awareness. We did get asked if we had a button though… and we had to say no. We simply hadn’t thought of making one. So, here you are. Two cool buttons you can use to link to our site. This one is from our ‘Wink If You’re Bi‘ shirt design. The button is 200×200 pixels, but re-sizes well. 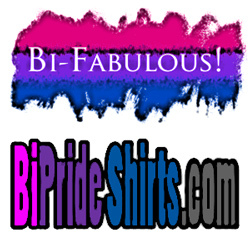 This one is 250×250 pixels and features our ‘Bi Fabulous‘ shirt design. This one looks cool even shrunk down to half the size so feel free to re-size. Thank you for showing the love and helping us out. Remember that we are wanting to help ALL types who identify as bisexual to express themselves, so if you have any great shirt design ideas just let us know. Keep spreading the awareness and sharing the love folks.